One of your favorite things to do in the world is to color and draw. You love adding colors to a picture and using your creativity. Why can’t a pony be purple? Why not give someone blue hair? What’s wrong with drawing your Dad with a flower growing out of his head? It’s your picture, right? As long as there’s a box of crayons by your elbow, you’re a happy kid and someday, you might be a world-famous artist. But what if there was a picture of you hanging in a museum? In the new book “Hope Somewhere in America” by Sydelle Pearl, illustrated by Astrid Sheckels, you might see what it’s like. Hope Sequoyah was born just as the Great Depression began. Her mother gave her a unique name because everybody needed hope, and because her mother wanted her to stand tall like Sequoyah trees. Five years later, Hope got another name and this is her story. It all started because her mother loved to paint. Mama had a job as a librarian, but knitting and painting were her favorite hobbies so she practiced and took classes until she could paint a canvas apple that looked good enough to eat! She was so good, in fact, that she was invited to show her paintings at an exhibit. It was a special exhibit, which called for a special painting, so Hope’s Mama decided to create a portrait. She asked Hope to pose with her teddy bear and that was hard. Hope had to sit for long hours and hold very still. Even a few weeks later, the painting wasn’t finished but Mama was very excited with it. She took it to show her teacher and he got very excited, too. He asked to meet the little girl with the unique name. At the studio, Mama’s teacher, Mr. Brackman, asked Hope some questions. He asked about her hair bow and her teddy bear. Then he told her he’d like to paint her picture, if that was okay. “Hope Somewhere in America” is cute and colorful, charming and a little cheeky, and based fictionally on a real painting. 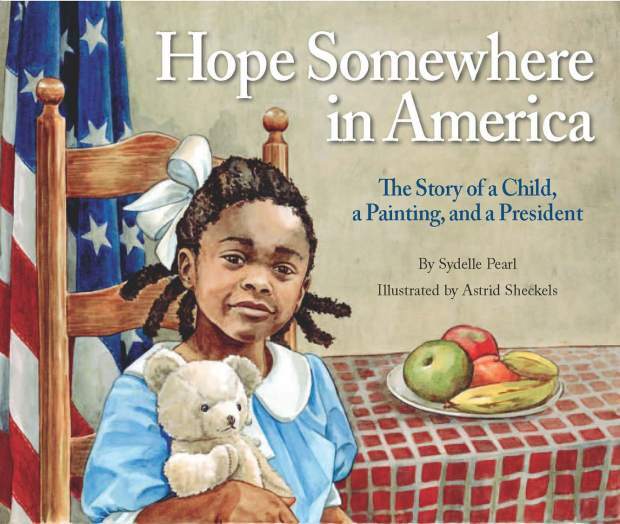 That very interesting “extra” may lend more meaning for 5-to-8-year-olds who might appreciate what’s going on in author Sydelle Pearl’s tale, especially if you can catch the real painting on tour or in the Smithsonian. As for smaller kids, I think that, while Astrid Sheckels illustrations are wonderful, this book may be a challenge for a flock of wiggly toddlers. They may like the story, but it’s longish for that age group.